Last weekend I took back a dress that my husband got me for my birthday and used that credit along with another gift card to buy some interview clothes. I got a blazer and three shirts. I already have a skirt and pants that will go with the blazer and I have some not too high heels as well. I still want a new bag, but I’m really trying not to spend any money as I won’t be getting a paycheck starting in July. Speaking of saving money, I haven’t eaten out since last Monday, the 14th! Not a single breakfast, lunch, or dinner. I did have Maria’s takeout last night, but it was free since my parents both work for the company. I’m pretty impressed with myself! We were supposed to take a little trip during my spring break, but it looks like that is out of the question now. Maybe we’ll just go down to my in-law’s ranch instead. It always feels like we’re on vacation when we go down there! I just remembered something: last summer when we started trying to get pregnant, I had imagined that we would have an infant at Easter and go down to my in-law’s with my parents. I actually pictured it in my head. The hardest part of this whole infertility thing has been all those holidays and milestones that I had allowed myself to mentally plan out. I’m really trying not to do that anymore. On the subject of infertility, I’m going to the doctor on Monday to ask about starting clomid. I’m really nervous about it, though, and am not sure I’m totally ready. It doesn’t seem like fun to go through all of those hormone changes while also interviewing for jobs. It might be too much to handle at once. On the other hand, I’m so ready to be a mom and I can’t put it off forever. The timing will never be just right, so I might just have to keep moving forward, especially since we don’t know how long it will take and what other treatments we’ll have to go through. I’m trying to think of more things to write, but my brain has gone blank. I’m so tired and stressed. I should go to the gym, but…. I’m just going to be lazy instead. I’ll leave you with a picture that shows what my lovely dogs did about 5 minutes before my sister-in-law came over last night. 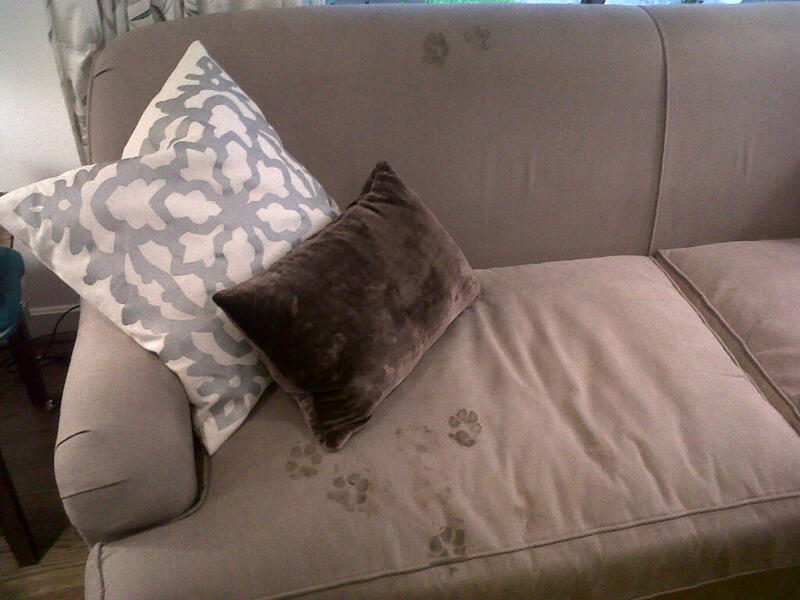 Good thing our friend Emily had the couch treated to be stain resistant! ← >Happy St. Patrick’s Day! >I wish you had a contact me tab so I could email you and not leave a comment!